When someone is truly passionate about their work, it becomes evident to people around that they love what they do. Sandeep Boniface is one such individual who demonstrates an immense love for the work that he does. Sandeep puts his heart and soul into each and every aspect of music. His constant attention to detail ensures that he always gives 110% of himself while performing, composing and teaching. 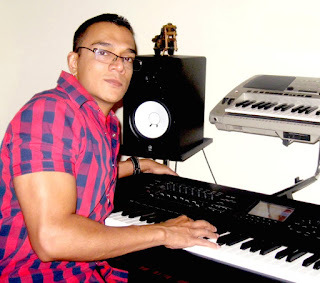 Sandeep began piano lessons at the age of seven. Two years later he started playing during church services. Since he was the youngest keyboardist ever to accompany the choir at his parish, it generated great curiosity within the congregation. In his first year of college, Sandeep wrote his first song, Tomorrow and performed it on stage during an intra-college competition. He went on to win the competition. Before long Sandeep was recognised in the competitive circuit as a contestant who performed only original music. After completing his pre-degree at Christ College, Sandeep went on to attend St. Joseph’s College of Commerce. Throughout his time at St. Joseph’s College of Commerce, the supportive student union ensured that Sandeep took part in most of the prominent inter-college competitions. Sandeep went on to win the Best Vocalist title at numerous colleges including Mount Carmel, Jyothi Nivas, St. Ann’s, St. Joseph’s Arts & Science, The Indian Institute of Science, The National Law School, Bangalore University, St. John’s Medical College, St. Xavier’s, & St. Joseph’s Commerce. In addition to competing in inter-college vocal competitions, Sandeep also competed in state-level competitions hosted by the Rotary Club. He won the titles Best Vocalist and Best Instrumentalist for three consecutive years at the state-level. Sandeep was also very successful in all of the inter-church/parish competitions in which he competed. After attending a music camp during his final year of college, Sandeep formed his band, Chromatix. Shortly there after, he decided that he wanted to study film scoring and vocals at Berkeley University in California. Sandeep made a demo featuring original compositions showcasing his vocal skills and sent it to Berkeley. The demo was extremely well received for Berkeley’s admissions’ office offered Sandeep not only admission to the music school, but also a sizeable scholarship. However, due to unexpected circumstances, Sandeep was forced to decline the offer. It was at this time that a five star line of hotels, The Taj, approached Sandeep about performing on weekends. During the year that Sandeep performed at The Taj he was introduced to many influential people. Sandeep was offered many opportunities in Bollywood. Even though the offers were promising and lucrative, it wasn’t something that he was passionate about. An evening in June 2002 changed Sandeep’s life in a major way. A few administrative staff members from The Canadian International School (CIS) came to The Taj and saw Sandeep perform. They were very impressed and requested him to perform at an upcoming graduation ceremony. This eventually led to Sandeep being asked if he would consider teaching music full-time at The Canadian International School. Although Sandeep assumed that he would try it out for just one year, he quickly came to realize that he loved working with children. Working at CIS full-time means that Sandeep has had to sacrifice time spent on his professional music. Sandeep has however managed to channelize his talent and skills as a songwriter at CIS, by forming a student group called Angel Flakes. Angel Flakes uses the power of song to help create and spread awareness of important social issues and has won a number of prestigious awards from various radio stations. Sandeep has produced two CDs. A gospel CD titled In Search that was marketed throughout India, Dubai and France. The other, a Christmas CD titled My Christmas Dream, mastered by Grammy award winning musician/producer, Ricky Kej. Sandeep has sung and composed music for numerous radio jingles, TV commercials, documentaries, films & theatre productions and has also lent his expertise as a music consultant for prestigious organizations such as the National Institute of Mental Health and Neuro Sciences. In January 2016, Sandeep realized his life-long dream of setting up his own recording studio which he has named D.J. Nitro Production. He maintains that his style of music has more scope in the international scene.